Tour to the Ancient Miletus entering into the city through the Gate of the Port of Lions. Numerous monuments and houses can be discerned. The Council House was built during the first half of the 2nd century BC, and is a characteristic example of Hellenistic architecture as far as the axial symmetry of the design, size and decoration are concerned. 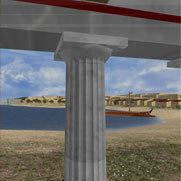 The building consisted of a majestic propylon with a tripartite entrance, an atrium surrounded on its three sides by a Doric colonnade, and the assembly hall. The Delphinion was an outdoor sanctuary devoted to Apollo Delphinios, and was the most important religious as well as political centre of Miletus from Archaic until Late Imperial times.